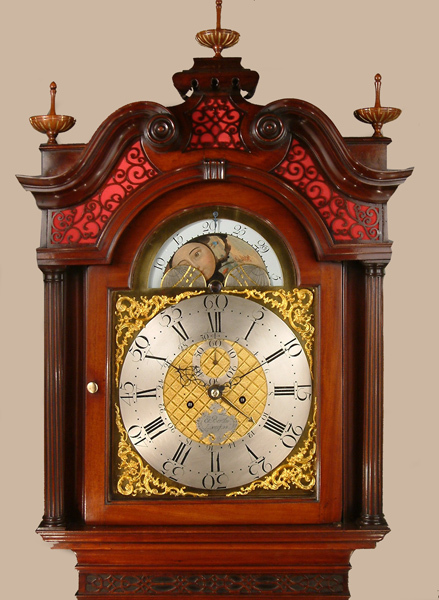 Edward Bertles of Liverpool Longcase Mahogany Circa 1780 - Height 98.2in. This Longcase Mahogany's Maker - E. ( Edward ) Bertles of Liverpool. Recorded 1777 - 1796, died 1797. N.B.Also seen spelt Birtles - see LCMAH 312 ( now sold ). Typical "Liverpool", late 18C, high quality, flame mahogany case with characteristic "flying saucer" finials, red "silk" backed frets and turned wooden paterae to swan neck pediment. Fluted "flying" hood columns with matching trunk quarter columns.Pierced fretwork under throat moulding. Book matched veneers carefully chosen to create a fountain effect to the shaped top trunk door and panelled base.All set on ogee bracket feet. 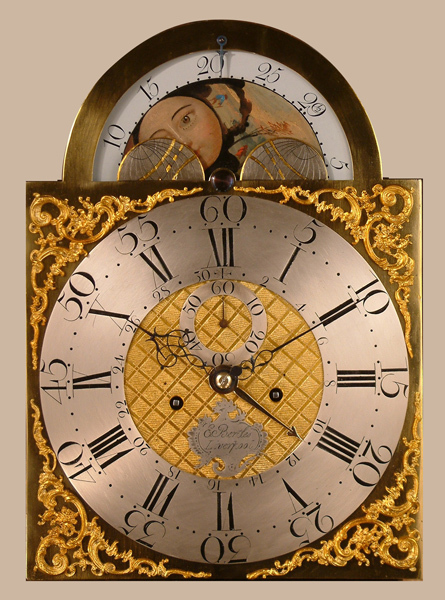 13" breakarch brass dial having moonphases to arch, typical Liverpool cross hatched dial centre, polished brass centre sweep date indicator, subsidiary seconds dial and cast brass rococo spandrels. 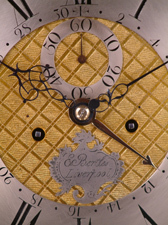 Typical Liverpool decorative cartouche engraved E. Bertles Liverpool to lower dial centre. Blued cut steel hands. Good quality, 4 knopped pillar, 8 day movement with hourly ( rack ) striking.Centre sweep date. E. ( Edward ) Bertles of Liverpool. Recorded 1777 - 1796, died 1797. N.B.Also seen spelt Birtles - see LCMAH 312 ( now sold ). 98.2" ( 249.4 cms. ) or 94" ( 238.8 cms. ).